The Thunderbirds are the air demonstration squadron of the U.S. Air Force (USAF), based at Nellis AFB in Las Vegas, Nevada. The squadron tours the United States and much of the world, performing aerobatic formation and solo flying in specially-marked USAF jet aircraft. Officers serve a two-year assignment with the squadron, while enlisted personnel serve three to four. Replacements must be trained for about half of the team each year, providing a constant mix of experience. The squadron performs no more than 88 air demonstrations each year and has never canceled a demonstration due to maintenance difficulty. In addition to their air demonstration responsibilities, the Thunderbirds are part of the USAF combat force and if required, can be rapidly integrated into an operational fighter unit. Since February 15, 1974 the Thunderbirds have been a component of the 57th Wing at Nellis AFB. Picture - The Thunderbirds flew F-84F Thunderstreaks in the 1955 and 1956 seasons. 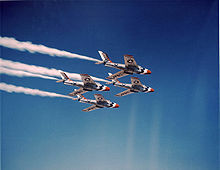 The Thunderbirds were activated, after 6 months training in an unofficial status, on May 25, 1953 as the 3600th Air Demonstration Team at Luke AFB, just west of Phoenix. Nowadays, they are officially designated the USAF Air Demonstration Squadron, and were activated as such on February 13, 1967. The Thunderbirds also carry the lineage of the 30th Bombardment Squadron, with which they were consolidated on September 19, 1985. The 30th was originally known as the 30th Aero Squadron, and was established on June 13, 1917 to serve in France during World War I. The squadron was later reconstituted and redesignated the 30th Bomb Squadron of the 19th Bomb Group, and saw combat in the Pacific theater during World War II as both a B-17 Flying Fortress and B-29 Superfortress squadron, and in the Korean War flying the B-29. It then became a component of the Strategic Air Command, equipped with B-47 Stratojet and B-52 Stratofortress bombers before its inactivation in 1963. The Thunderbirds flew their debut exhibition at Luke AFB in early June 1953, and began public exhibitions at the 1953 Cheyenne Frontier Days in Cheyenne, Wyoming. The team had flown 26 shows by that August. The first team leader was Major Richard C. Catledge (1953-1954), and the first plane used by the unit was the straight-wing F-84G Thunderjet. Because the Thunderjet was a single seat fighter, a two-seat T-33 Shooting Star served as the narrator's aircraft and was used as the VIP/Press ride aircraft. The T-33 served with the Thunderbirds in this capacity in the 1950s and 1960s. The next year the Thunderbirds performed their first overseas air shows, in a tour of South and Central America, and added a permanent solo routine to the demonstration. In the spring of 1955, under their second commander/leader (September 1954 - February 1957), Captain Jacksel M. Broughton, they moved to the swept-wing F-84F Thunderstreak aircraft, in which they performed 91 air shows, and received their first assigned support aircraft, a C-119 Flying Boxcar. The Thunderbirds' aircraft were again changed in June 1956, to the F-100C Super Sabre, which gave the team supersonic capability. This switch was accompanied by a move of headquarters to Nellis AFB, Nevada on June 1 because of maintenance and logisitical difficulties of basing the F-100s at Luke, with their first show after the move being held on June 23. It also signaled a shift in their performance routine-for example, the Cuban 8 opening routine was dropped, and emphasis was placed on low, screaming flyovers and demonstrations of takeoff performance. 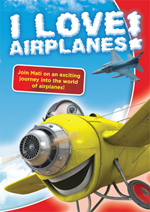 For a time, if the show's sponsor permitted it, the pilots would create a "sonic boom" (this ended when the FAA banned supersonic flight over the continental U.S.). The move to Nellis also resulted in the first assignment of buildings and hangar space to the team. In 1960 a decision was made to allow the tail (vertical stabilizer) of the #4 slot plane, blackened by the exhaust of the other planes, to remain black. (Contrary to rumor, the stabilizer was never painted black.) This practice remained in force through the 1973 season. In 1961, the team was compelled to discontinue the vertical bank maneuver due to an FAA regulation prohibiting aerobatics that pointed the nose of the aircraft toward the crowd. 1962 saw the introduction of dual solo routines, and the Thunderbirds went on their first European deployment in 1963, the year after the disbanding of the "Skyblazers" (see below). The team switched to the F-105 Thunderchief for a brief period, but returned to the F-100 in 1964 after only six airshows, when structural failure of an F-105 in a pitch-up for landing resulted in the death of Capt. Gene Devlin at Hamilton Air Force Base. The F-100 was also judged to be more maneuverable for demonstration displays, and was retained through the 1968 season. By 1967, the Thunderbirds had flown 1,000 shows. In 1969, the squadron adopted the noisy and huge F-4E Phantom, which it flew until 1973, the only time the Thunderbirds would fly jets similar to those of the Blue Angels, as it was the standard fighter for both services. A special white paint had to be developed to cover high-temperature metals, replacing the bare metal paint scheme of past planes. The white paint scheme has been continued to the present. Due to the 1973 oil crisis, the team only flew six air shows and was grounded for some time. However, in 1974 they switched to the more economical T-38 Talon. Five T-38s used the same amount of fuel needed for one F-4 Phantom. The switch to the T-38 also saw an alteration of the flight routine to exhibit the aircraft's maneuverability in tight turns, and also ended the era of the black tail on the #4 slot plane, which would now be regularly cleaned and shined like the others. In 1982, the Thunderbirds suffered a catastrophic loss, occurring during pre-season training on January 18. While practicing the four-plane diamond loop, the formation impacted the ground at high speed, instantly killing all four pilots: Major Norman L. Lowry, commander/leader, Captain Willie Mays, Captain Joseph N. "Pete" Peterson, and Captain Mark Melancon. The cause of the crash was officially listed by the USAF as the result of a mechanical problem with the #1 aircraft's control stick actuator, resulting in insufficient back pressure by the formation leader on the T-38 control stick during the loop. Visually cueing off of the lead aircraft during formation maneuvering, the wing and slot pilots completely disregarded their positions relative to the ground. The team's activities were suspended for six months pending investigation of the crashes and review of the program, then reinstituted using the General Dynamics F-16A Fighting Falcon. They upgraded to the F-16C (now Lockheed-Martin) in 1992. In 1986, the Thunderbirds did a fly-by for the re-dedication of the Statue of Liberty in New York City, which was viewed by tens of millions. They also performed the first American military demonstration in a communist country when the team visited Beijing, China in 1987. Their 3,000th air show was performed in 1990, and in 1991 the team went overseas to perform air show in Switzerland, Poland and Hungary. The team traveled abroad again in 1996, visiting Romania, Bulgaria and Slovenia. Also in 1996, the team participated in the Atlanta Olympics' opening ceremonies, which were viewed by an estimated 3.5 billion people worldwide. The United States Postal Service honored the Air Force's 50th anniversary as a separate branch of the military in 1997 with a limited edition stamp featuring the Thunderbirds. Picture - Thunderbirds F-16s (including three spare aircraft, for a total of nine) precisely lined up on the ramp at Nellis AFB just prior to the team's last performance of 2004. In 2005, the Thunderbirds temporarily grounded themselves pending an investigation into a minor mid-air incident during the Chicago Air & Water Show on August 20. During a diamond formation slow-roll pass, the tip of the missile rail on the right wing of the slot (#4) aircraft contacted the left stabilator of the right (#3) aircraft. A four-foot section of the missile rail snapped off, while the #3 aircraft sustained damage described by one of the Thunderbirds pilots as a "medium deep scratch" to the red paint of the stabilator. Amateur video showed the missile rail falling into the "safety box" on Lake Michigan away from boaters. While there were no injuries and the aircraft remained apparently flightworthy, the demonstration was immediately terminated, all aircraft returned to Gary International Airport, and the Thunderbirds did not return for the second day of the Chicago show. The right winger (#3) was Major D. Chris Callahan, and the slot position (#4) was flown by Major Steve Horton. The 2007 European Goodwill Tour was the Thunderbirds’ first visit to Europe after the September 11th attacks. 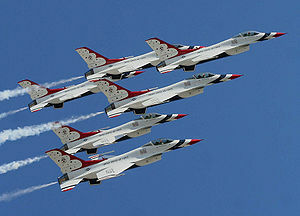 During this tour, the Thunderbirds’ performed at their first-ever air show in Ireland. Despite inclement weather, more than 100,000 people attended the air show, garnering nationwide exposure by Irish media. Additional stops along the way included aerial demonstrations in Poland, Romania, Bulgaria's Graf Ignatievo Air Base, Italy, France and England, where the Thunderbirds participated in the Royal International Air Tattoo, the world’s largest air show. Outside of aerial demonstrations, the team participated in eight official public relations events attended by heads of state and local civic leaders. The team also conducted community outreach by meeting with needy children throughout Europe. On November 10-11, 2007, the City of Las Vegas and Nellis AFB saluted the U.S. Air Force, hosting the capstone event of the USAF's 60th anniversary celebration. Picture - Formation composed of aircraft from the Snowbirds (CT-114), Red Arrows (Hawk), Thunderbirds (F-16) and Blue Angels (F/A-18). In 2008, the Thunderbirds remained in North America, performing in both the United States and Canada. When Quebec City celebrated its 400th anniversary, the Thunderbirds joined the Canadian Forces' Snowbirds, the British Royal Air Force's Red Arrows, and the United States Navy's Blue Angels in a ceremonial flight over Quebec City. Later in the year, the team returned to Canada for two shows in Abbotsford, British Columbia. In 2009 the Thunderbirds hired their first-ever Air National Guard pilot, Lt. Col. Derek Routt as Thunderbird #7 (operations officer), and the first-ever Reserve pilot, Maj. Sean Gustafson, also joined the team as Thunderbird #4 (slot). The 2009 Far East Tour took the team to multiple locations on western border of the Pacific Rim and included performances in Hawaii, Australia, Malaysia, Guam, Thailand, Japan, and South Korea. More than 1.2 million people saw the shows in person and more than 120 million were exposed to the shows through their national media. These are conservative estimates as one Korean prime-time television show alone reached 8 million. 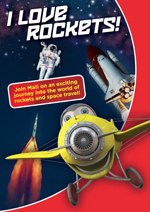 The top-rated show, "Requirements to be a Man" did a one-hour feature on the Thunderbirds and resulted from a coordinated media pitch to the network and the Republic of Korea Air Force. At every venue, feedback from the embassies and foreign militaries was overwhelmingly positive. In addition to the air shows, the Thunderbirds personally met and spent time with 500+ special needs children and orphans. Republic F-84G Thunderjet Employed by the Thunderbirds from 1953-1954. Republic F-84F Thunderstreak The Air Force selected the swept-wing F-84F Thunderstreak as their second aircraft in 1955, modified for the team by adding smoke tanks, and red, white and blue drogue parachutes. Used from 1955-1956. North American F-100C Super Sabre With the change to the F-100 Super Sabre in 1956, the Thunderbirds became the world’s first supersonic aerial demonstration team. That same year, the Thunderbirds moved to Nellis Air Force Base, Nevada, simplifying logistics and maintenance for the aircraft. The Thunderbirds used the C-model Super Sabre from 1956-1963. Republic F-105B Thunderchief Only six shows were flown in 1964 using the F-105 before safety concerns resulted in the team's adoption of the F-100D. North American F-100D Super Sabre The D-model Super Sabres were used from 1964-1968. McDonnell F-4E Phantom II The 1969 conversion to the F-4 was the most extensive in the team’s history. Among other modifications, paints that had worked on the F-100 appeared blotchy on the F-4 because of multicolored alloys used to resist heat and friction at Mach 2 speeds. A polyurethane paint base was developed to resolve the problem. The white paint base remains a part of today’s Thunderbird aircraft. A popular myth is, given the exhaust emissions of the F-4's engines, the vertical stabilizer of the #4 slot aircraft was painted flat black. This is however false and the vertical stabilizer of the #4 slot aircraft was allowed to be blackened by jet exhaust starting in 1960. Phantoms were used from 1969-1973. Northrop T-38 Talon The fuel crisis of the early 1970s resulted selection of the Northrop T-38A Talon, a supersonic trainer. Five T-38s used the same amount of fuel needed for one F-4 Phantom, and fewer people and equipment were required to maintain the aircraft. Although it met the criteria of demonstrating the capabilities of a prominent Air Force aircraft, the Talon did not fulfil the Thunderbird tradition of flying front-line jet fighters. The team flew the Talon from 1974-1981. Picture - Opposing pass performed by the Thunderbirds opposing solos. In 1982 the team switched to the F-16A Fighting Falcon; this transition had been under consideration before the "Diamond Crash" during training season in January. The team sat out the 1982 airshow season and spent that year retraining and transiting over into the new aircraft to ready themselves for the 1983 season. In rebuilding the Thunderbird Team, the Air Force recruited previous Thunderbird pilots, qualified each in the F-16A, and had them begin by flying "two-ship" maneuvers, then expanded the program, one airplane at a time, up to the full six airplanes. Beginning in June 1982, the F-16 Thunderbirds were led by Major Jim Latham. The team continues to fly the F-16, having switched from the F-16A to the F-16C in 1992. Only a few minor modifications differentiate a Thunderbird from an operational F-16C. These include the replacement of the 20 mm cannon and ammunition drum with a smoke-generating system, including its plumbing and control switches, the removal of the jet fuel starter exhaust door, and the application of the Thunderbirds' glossy red, white, and blue polyurethane paint scheme. All of the modification work is performed at the maintenance depot at Hill AFB near Ogden, Utah. General Dynamics F-16A/B Fighting Falcon During the switch to the F-16A the Thunderbirds acquired new block 15 aircraft which they operated from 1983-1991, making the team one of the last USAF units flying the older F-16A's before transitioning into new C's. They also operated the two-seat F-16B during this time for training new pilots and for VIP flights, these being replaced by the F-16D when the rest of the squadron transitioned to the F-16C. Lockheed Martin F-16C/D Fighting Falcon (Block 32) The block 32H/J aircraft currently assigned to the Thunderbirds were built in 1986 & 1987, and operated by the Thunderbirds from 1992-2008. At their retirement, they were some of the oldest operational F-16s in the Air Force. Lockheed Martin F-16C/D Fighting Falcon (Block 52) In the 2009 show season the Thunderbirds transitioned to an updated version of the F-16 fighter. The Block 52s have an upgraded avionics package that brings the Thunderbird fleet into alignment with the rest of the worldwide F-16 fleet. Additionally, the more powerful Pratt & Whitney F100-PW-229 engine adds an additional 3,600 lbf of thrust. This in turn increases the maximum allowable gross weight for ground handling, taxi, takeoff and in-flight maneuvers by nearly 5,000 lbf. From the end of the runway the 4-ship Thunderbird team get ready to begin their take-off roll with the words "Thunderbirds run em up!" being retransmitted from the team leader's mic through the PA system for the crowd to hear. Diamond: Historically, as Thunderbirds 1 through 4 lift off, the slot aircraft slips immediately into position behind 1 to create the signature Diamond formation. Thanks to the 2009 upgrade to the Block 52, the Diamond now has more than enough thrust to continue to climb straight up into their first maneuver, the Diamond Loop. Solos: Thunderbird 5 takes to the air next performing a clean low altitude aileron roll followed by 6 who performs a split-s climbing in a near vertical maneuver rolling over and diving back toward show center pulling up just above the runway and exiting in the opposite direction. 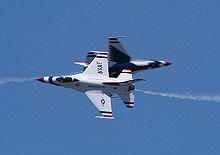 Much of the Thunderbirds' display alternates between maneuvers performed by the diamond, and those performed by the solos. The diamond performs maneuvers in tight formation such as formation loops and rolls or transitions from one formation to another. The opposing solos usually perform their maneuvers just under the speed of sound, and show off the capabilities of their individual F-16s by doing maneuver such as fast passes, slow passes, fast rolls, slow rolls, and very tight turns. Some of their maneuvers include both solo F-16s at once, such as opposing passes (passing in close proximity to each other) and mirror formations (their two F-16s being flown back-to-back in the calypso pass or belly-to-belly. In mirror formations, one Thunderbird must be inverted, and it is always Thunderbird number 5. In fact, the "5" on this aircraft is painted on upside down, and thus appears right-side-up for much of the routine). At the end of the routine, all six aircraft join in formation, forming the Delta. There is also an extra amount of humor regarding the inverted performance of Thunderbird Five: the pilots all wear tailored flight suits with their name and jet number embroidered on the left breast. The 5 is sewn inverted. One of the Thunderbirds' standing engagements is the annual commencement ceremony at the United States Air Force Academy in Colorado Springs. The jets fly over Falcon Stadium at the precise moment the cadets throw their hats into the air at ceremony's end. The Thunderbirds have performed at over 4,000 airshows worldwide, accumulating millions of miles in hundreds of different airframes over the course of their 54+ years of service. Flying high performance fighter jets is inherently dangerous; when flying in extremely close formation the danger is compounded. The team has suffered two fatal crashes during air shows. The first was the death of Major Joe Howard flying Thunderbird 3 on June 4, 1972 at Dulles Airport, during Transpo 72. His Phantom (F-4E s/n# 66-0321) experienced a structural failure of the horizontal stabilizer. Maj Howard ejected as the aircraft fell back to earth from about 1,500 feet tail first and descended under a good canopy, but was too close to the explosion fireball and did not survive. The second death occurred May 9, 1981 at Hill AFB, Utah, when Captain David "Nick" Hauck flying Thunderbird 6 crashed while attempting to execute a slow speed maneuver. The high density altitude and subtly rising terrain coupled with Capt Hauck's slow speed put him in a dangerous flight envelope. He hit the ground before realizing his precarious situation. The aircraft hit a large oak tree and a barn, then slid across a field and flipped as it traversed an irrigation canal, ultimately erupting into a fireball just a few hundred feet from the runway's end. No one on the ground was injured even though the wreck occurred adjacent to a roadway packed with onlookers. 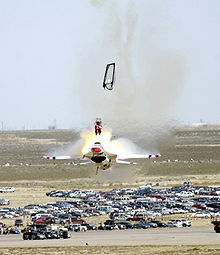 Picture - Captain Chris Stricklin ejects from his F-16 at an air show in September 2003. September 24, 1961: TSgt John Lesso of the Thunderbirds C-123 crew was killed when an Air Force C-123 carrying the Army Golden Knights, on which he was flight engineer, crashed during take-off at an airshow in Wilmington, North Carolina. June 4, 1972: Major Joe Howard, flying Thunderbird 3, was killed during the Transpo 72 airshow at Dulles International Airport. May 9, 1981: Captain David "Nick" Hauck, flying Thunderbird 6, was killed during an airshow at Hill AFB, Utah. September 14, 2003: 31-year-old Captain Chris Stricklin, flying Thunderbird 6 (opposing solo), failed to pull out of a dive but safely ejected at Mountain Home Air Force Base, Idaho. Stricklin miscalculated the altitude required to complete his opening maneuver, a "Split S", and climbed to an inadequate altitude of 1670 feet above ground level (AGL), instead of 2500 feet, before initiating the pull-down dive of the maneuver. The accident occurred due to the difference in mean sea level (MSL) altitudes between Mountain Home and Nellis AFBs, approximately 1,100 feet. Stricklin ejected just 0.8 seconds before impact. His parachute deployed just above the ground and he sustained only minor injuries from the ejection. There were no injuries to spectators. As a result of the crash, Thunderbird pilots now call out AGL instead of MSL altitudes. December 13, 1954: Capt George Kevil was killed during solo training at Luke in an F-84G. September 26, 1957: 1st Lt Bob Rutte was killed in solo training at Nellis. October 9, 1958: 19 men aboard the Thunderbirds' support C-123 were killed in a crash about 50 miles northwest of Boise, Idaho, while en route to McChord AFB, reportedly when the transport struck a flock of geese . March 12, 1959: Capt C.D. Salmon was killed in solo training at Nellis. July 27, 1960: Capt J.R. Crane, advance pilot and narrator for the team, was killed during a solo proficiency flight at Nellis. April 6, 1961: Maj Robert S. Fitzgerald, commander/leader of the team, and Capt. George Nial, advance pilot and narrator, were killed during training at Nellis. May 9, 1964: Capt Eugene J. Devlin was killed when his F-105 broke apart as it pitched up for landing from a three-plane formation pass over Hamilton Air Force Base, California. October 12, 1966: Maj Frank Liethen and Capt. Robert Morgan were killed in a collision of two F-100s, one crashing, at Indian Springs Auxiliary Field in Nevada. January 9, 1969: Capt Jack Thurman was killed in solo training at Nellis. December 21, 1972: Capt Jerry Bolt and TSgt Charles Lynn were killed during a flight test at Nellis. July 25, 1977: Capt Charlie Carter, Thunderbird pilot and narrator, was fatally injured during maneuvers at F.E. Warren Air Force Base in Wyoming. May 9, 1981: Capt Nick Hauck is killed in the crash of his No. 6 T-38 during a low approach at Hill Air Force Base, Utah. September 8, 1981: Lt Col David L. Smith, commander of the Thunderbirds, was killed when his aircraft ingested seagulls and stalled while leaving Cleveland, Ohio. Smith crashed into Lake Erie without attempting to eject. January 18, 1982: The "Diamond Crash", the worst training crash in Thunderbird history, occurred when Maj Norman L. Lowry, Capt Willie Mays, Capt Joseph N. Peterson, and Capt Mark Melancon were killed while practicing a line abreast loop during training at Indian Springs Air Force Auxiliary Field in T-38s. The first USAF jet-powered aerobatic demo team was the "Acrojets", performing early in 1949 with F-80Cs at the USAF Fighter School at Williams Air Force Base, Arizona, and was headed by Col (then Capt) Howard W. "Swede" Jensen. This team flew together until August 1950, when it was deactivated due to the American commitment to the Korean War. Additionally, there was also a later USAFE "Acrojets" team in Germany, this one made up of USAF T-33 Shooting Star instructor pilots at Fx�rstenfeldbruck AB in the mid-1950s. The "Skyblazers" were the USAF demonstration team representing the United States Air Forces Europe (USAFE) from the late 1940s through the 1950s. 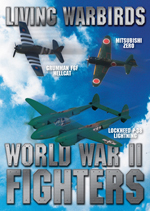 This team was formed in early 1949 by a group of 22d Fighter Squadron pilots from the 36th Fighter Wing at Fx�rstenfeldbruck Air Base in Germany. 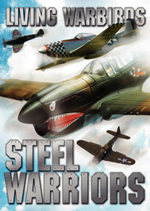 At this time they were flying Lockheed F80B Shooting Stars. The unit transitioned to the F-84E in 1950, the F-86F in 1955 and the F-100C in 1956. Two of the original Skyblazer team members, identical twins C.A. "Bill" and C.C. "Buck" Pattillo, went on to become members of the first Thunderbird team. Unlike the Thunderbirds, the Skyblazers seldom appeared outside of the realm of USAFE operations in Europe. The Skyblazers were disbanded in January 1962 when their home squadron was rotated back to the United States and their assigned aircraft transitioned to the F-105 Thunderchief.